The assessment crew pointing out vegetative hazards on the wildland-urban interface of Paniolo Hale. 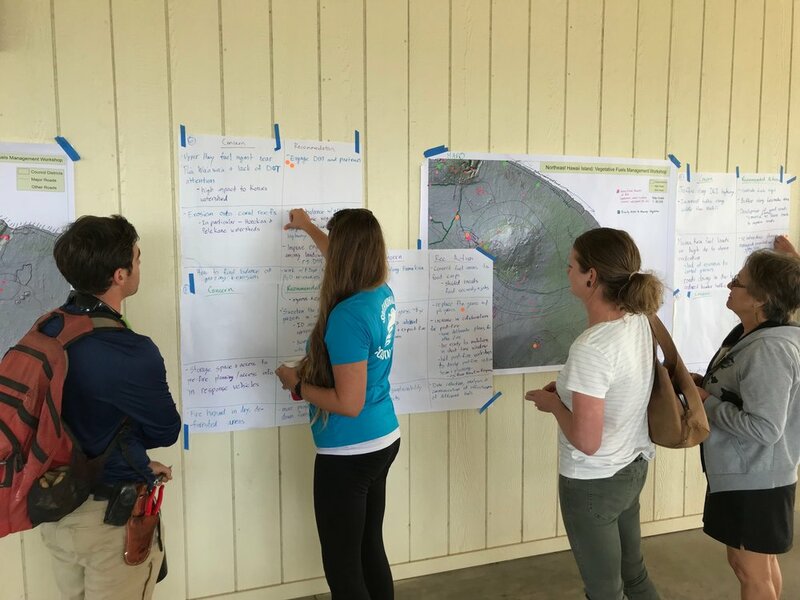 On April 1, 2019, HWMO flew to Molokaʻi, past the stunning cliffs of the North Shore, for a Firewise community hazard assessment of Paniolo Hale on the West End. Paniolo Hale is an 8.75-acre condominium complex consisting of 21 buildings that include 76 dwelling units and a main office. Approximately 140 people live there, but nearly all are part-time residents (only about a half-dozen or so are full-time residents). Each unit is privately owned and ranges from studios to one or two-bedroom units. There is a resident manager and landscaping manager on-site. The condos are located in Kaluakoi in West Molokaʻi as part of a larger cluster of resort-style homes and vacation rentals along the scenic Kepuhi Beach (Paniolo Hale being the northern-most development in this zone). Across the gulch from Paniolo Hale due south is the partially-abandoned Kepuhi Beach Resort. Although some of the buildings are completely abandoned, many of the buildings are used as vacation rentals. Most of the grounds’ vegetation is still maintained, but the large golf course surrounding it is no longer in use and has gone fallow since the resort officially closed over a decade ago. Another condominium complex is situated due southeast of Paniolo Hale: Ke Nani Kai. Captain Hanale Lindo of Maui Fire Department in front of roadside fuels. An abandoned golf course that once served as a wildland buffer, or greenbreak, for the community. The assessment team taking a look at the wildland fuels. 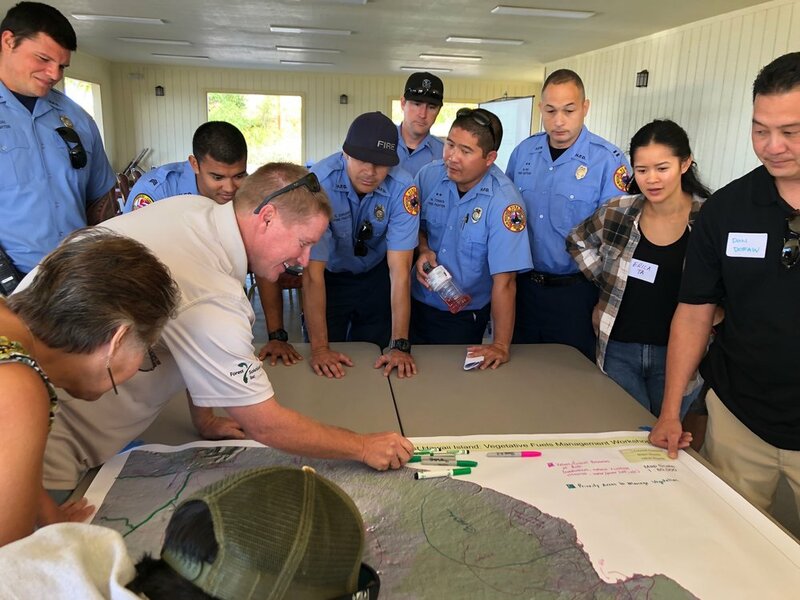 In early 2019, HWMO was contacted by the landscaping manager of Paniolo Hale for advice on wildfire prevention opportunities for the community. 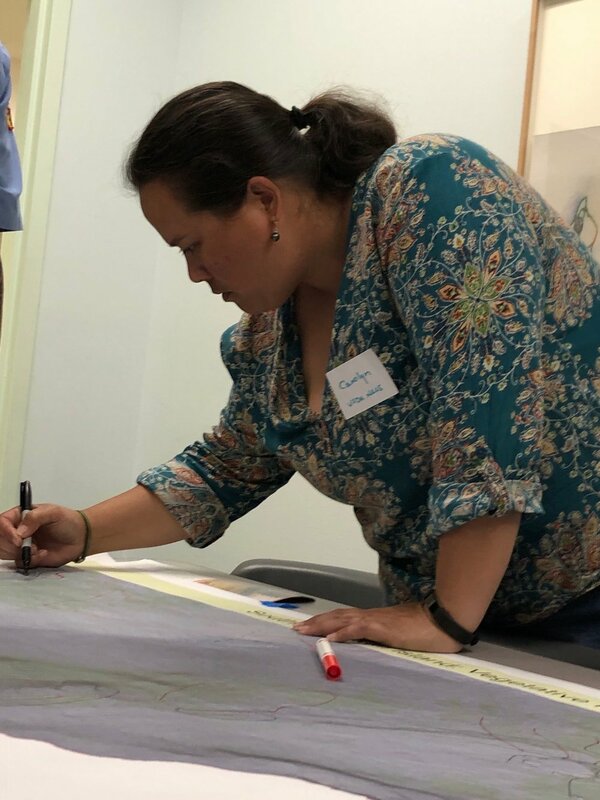 HWMO informed her about Firewise Communities and after a short turnaround, the Paniolo Hale neighborhood board decided to proceed in working towards Firewise Community recognition. 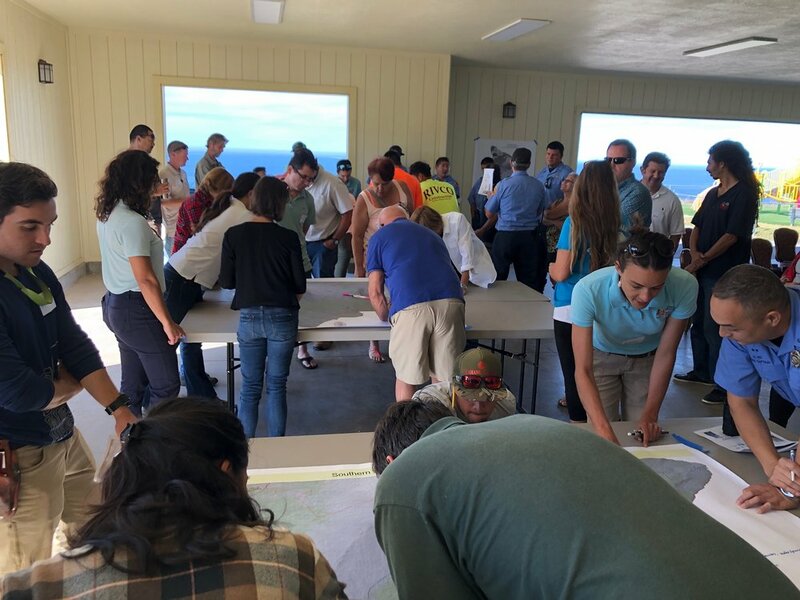 As a first major step, a group of proactive residents and Paniolo hale staff met with HWMO, Maui Fire Department, and State Division of Forestry and Wildlife for the Firewise hazard assessment. 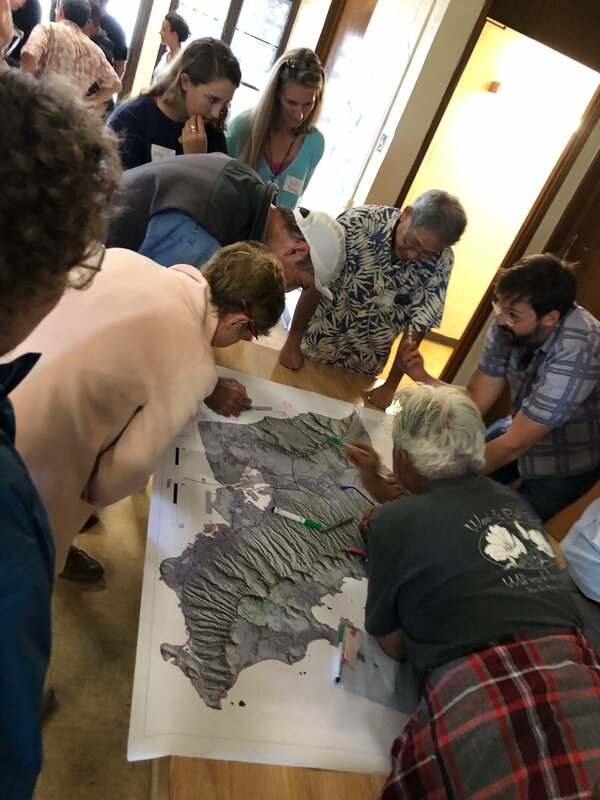 The assessment team first convened at the Paniolo Hale main office to map out an itinerary for the day, determine priority community areas to examine on the field assessment, and establish boundaries for the Firewise site. Following the meeting, the group walked to several areas to gain a vantage point of the intersection between wildland and urban areas. Along with these priority areas, the team also visited several representative homes to conduct a “Home Ignition Zone” assessment to better comprehend the wildfire hazards at the individual household level and identify locally-relevant examples of best practices for creating defensible space and fire-proofing structures. The scenic Kepuhi Beach near Paniolo Hale. 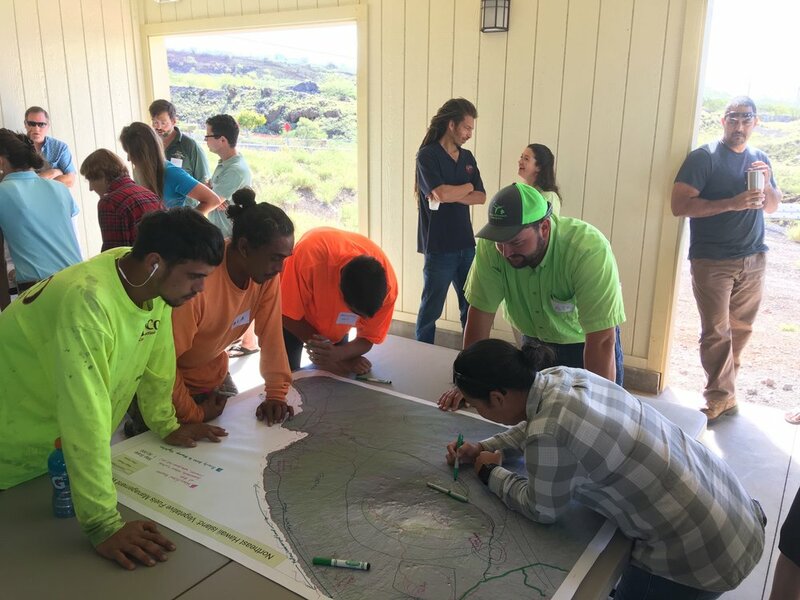 Paniolo Hale is well on pace to become the first Firewise Community on Molokaʻi by the end of 2019! Mahalo Paniolo Hale! 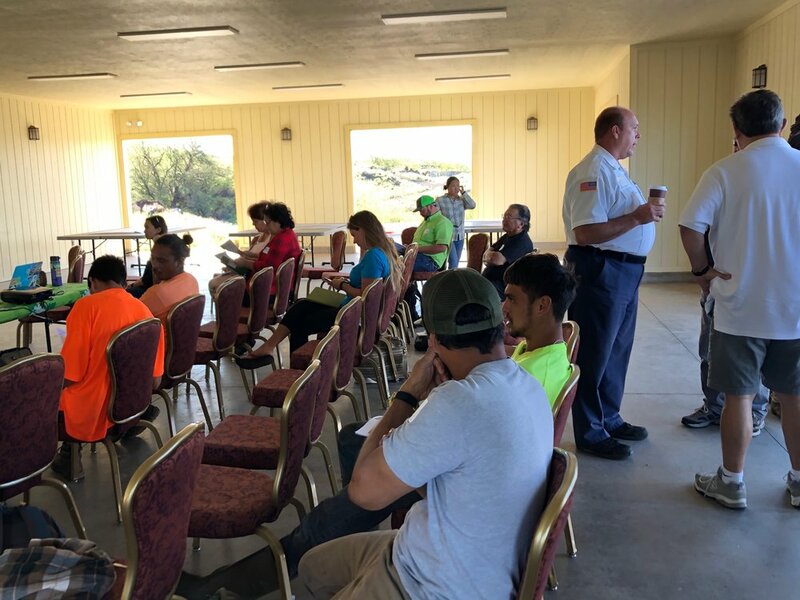 HFD gives a presentation on wildfire access in Puukapu. 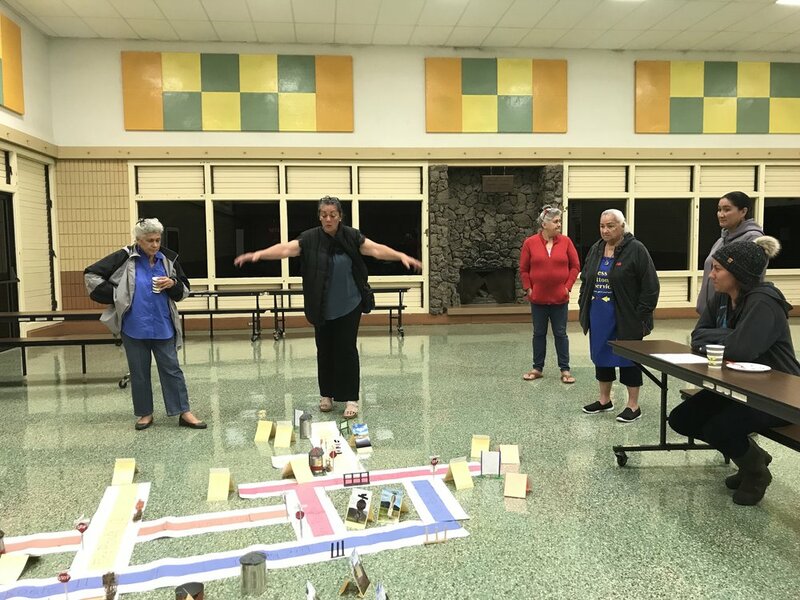 An elaborate 3D map the Puukapu Pastoral committee assembled. 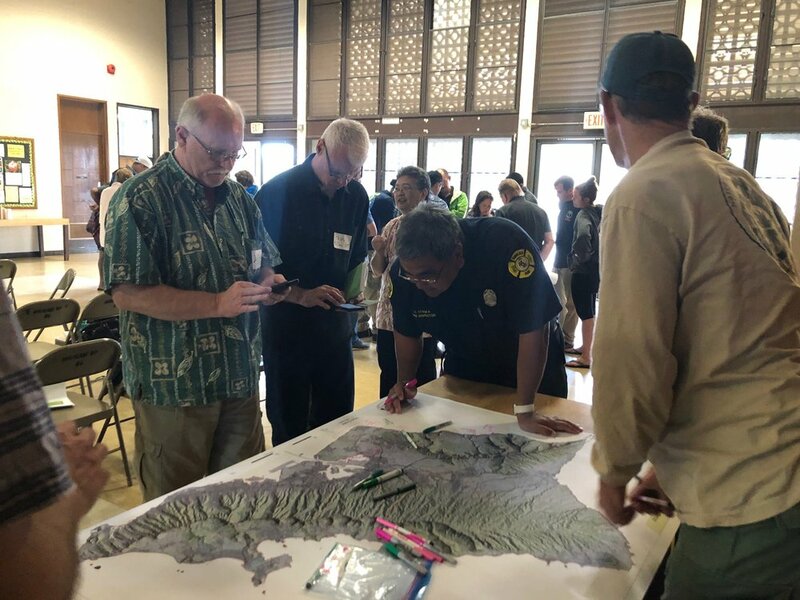 Last year, Puukapu Pastoral became the 9th Firewise Community on Hawaii Island (and the 4th Firewise Community statewide on Hawaiian Home Lands). 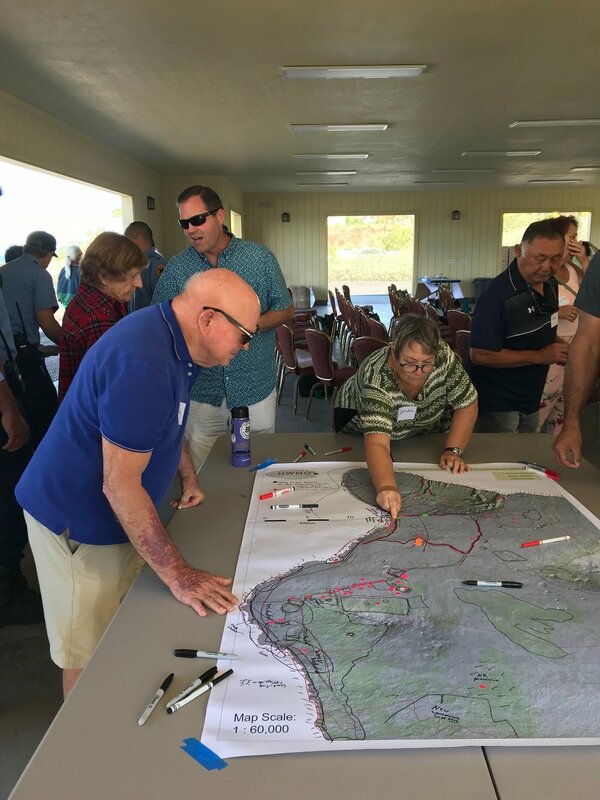 A committed group of community members from Puukapu Pastoral Steering Committee / Firewise are taking action to reduce the fire threats of the Waimea homestead area. 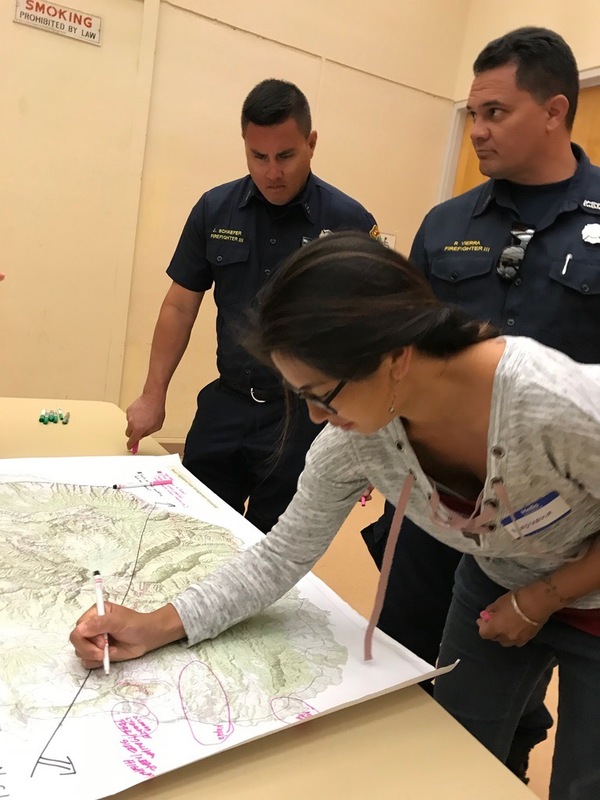 Through outreach and education, community members are reaching out to neighbors about the importance of creating defensible space around houses, hardening homes, and having a household evacuation plan. The committee is also developing a well-thought-out, community-driven plan to create safer first response access and ingress/egress. 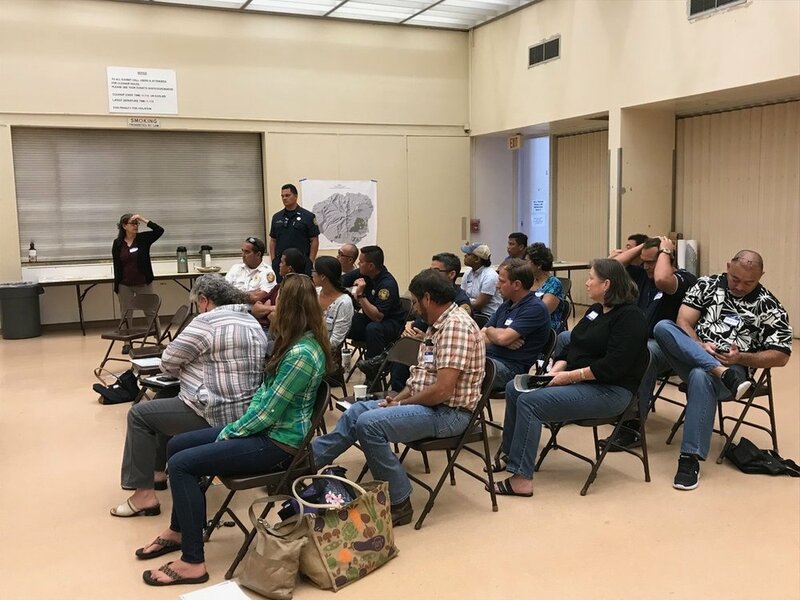 On March 21, the committee held a community meeting and invited HWMO and HFD representatives to give presentations. HWMO’s Pablo Akira Beimler gave a comprehensive Ready, Set, Go! wildfire preparedness workshop to the intent participants. 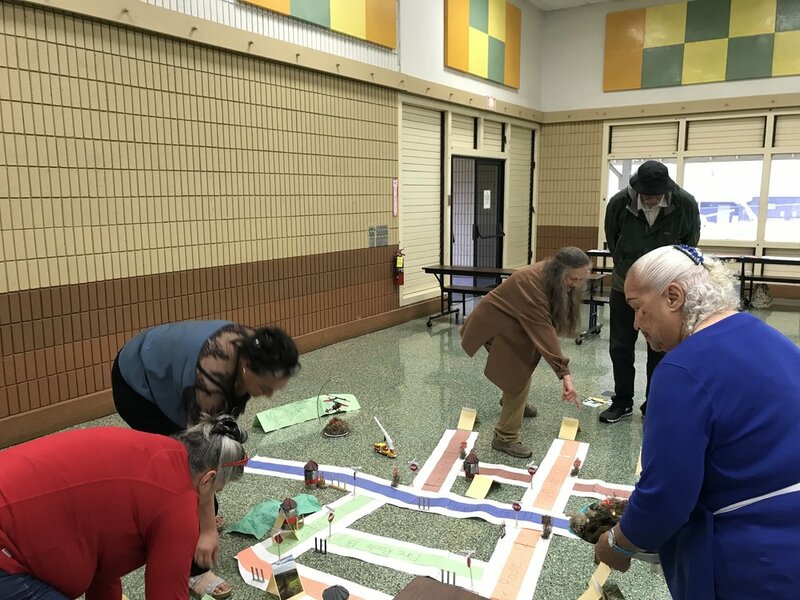 The highlight of the night for us was to see an amazing 3D map the committee members had created (they were up till the wee hours of the night!) 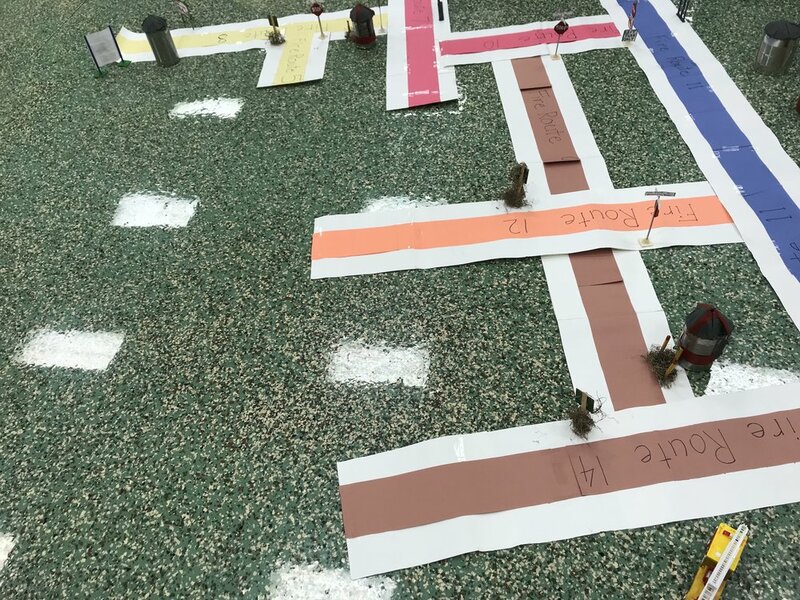 to demonstrate their color-coded road system proposal. We were very impressed with the level of detail and the immense effort and care the group put into this project. This community spirit is what keeps HWMO motivated to do the work that we do and support efforts like this. Keep up the great work, Puukapu! 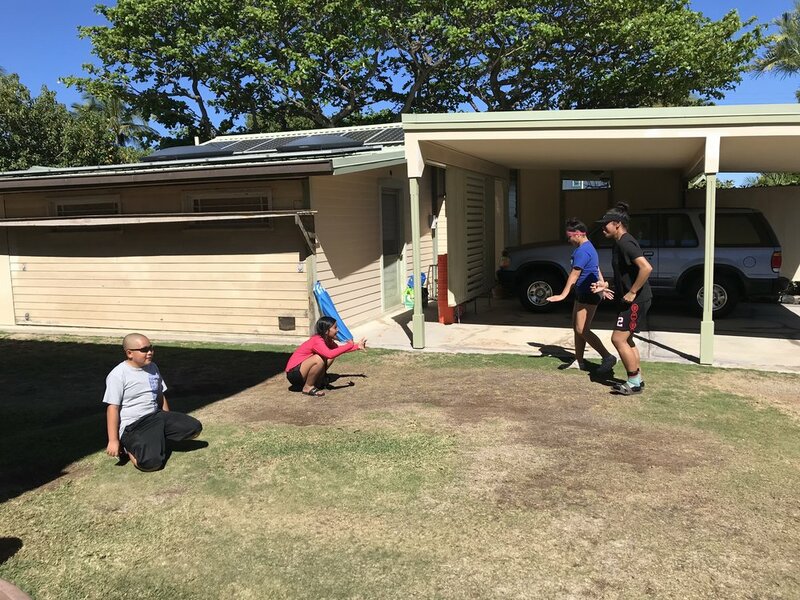 Playing “fire tag” in Puako. 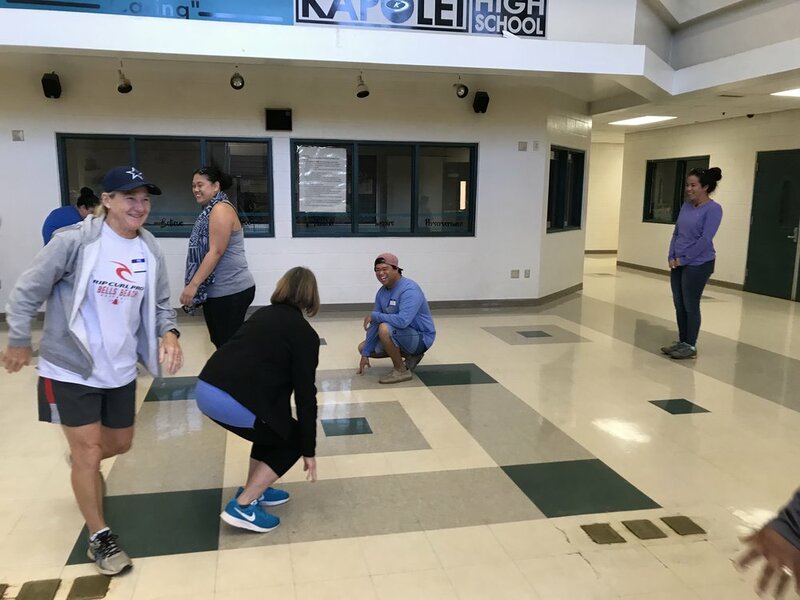 March 14 was Waimea Middle School IKAIR Day - a day of service for WMS students and faculty. 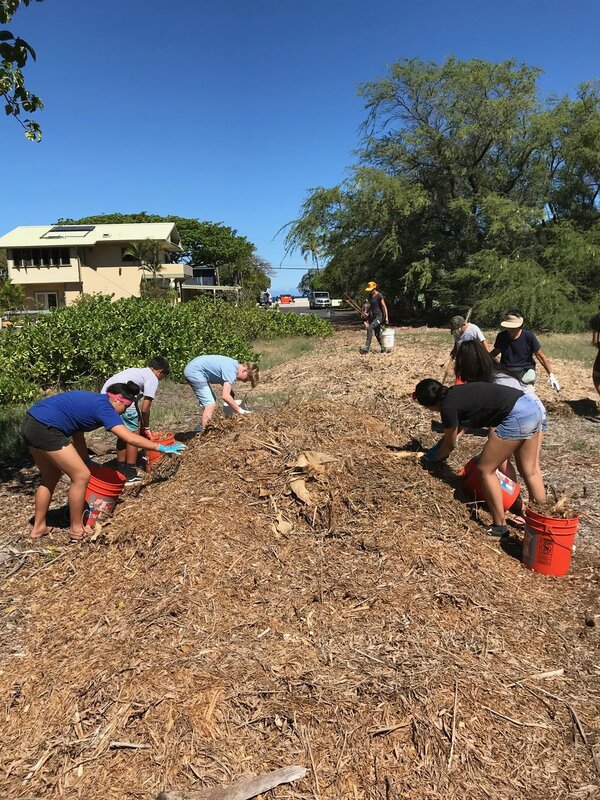 Several groups from WMS visited different project sites around North Hawaii. 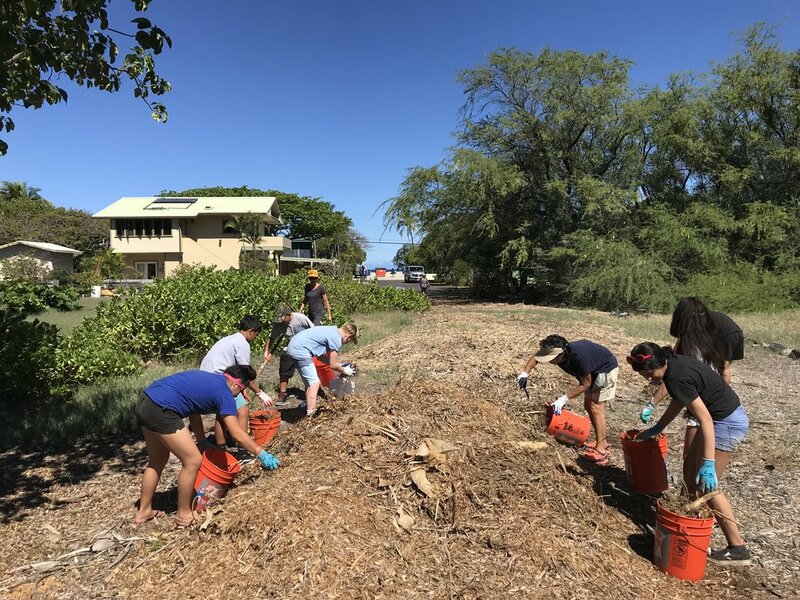 One group joined Keep Puako Beautiful and the Kohala Center at Puako (a Firewise Community) to collect and measure marine debris and spread mulch onto the community fuelbreak. 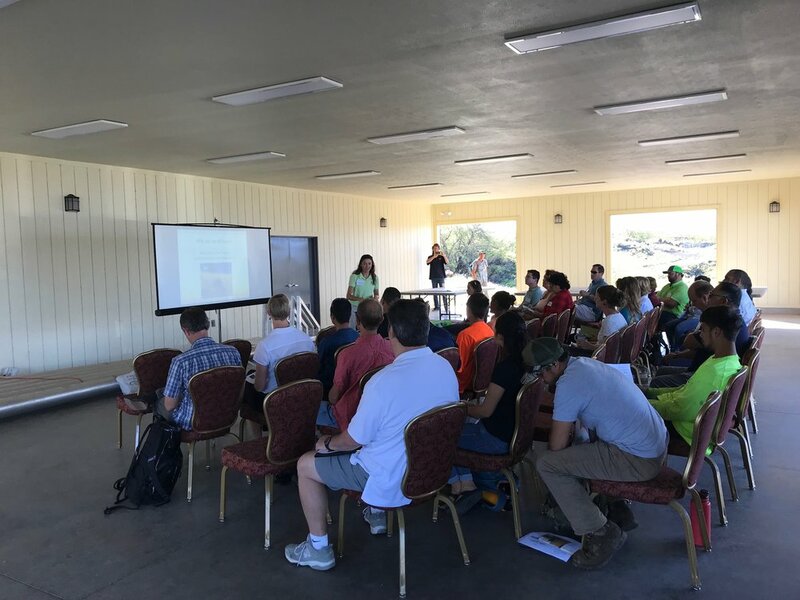 HWMO was invited to give a brief presentation on the history of the fuelbreak and the importance of pre-fire action and native plant restoration. 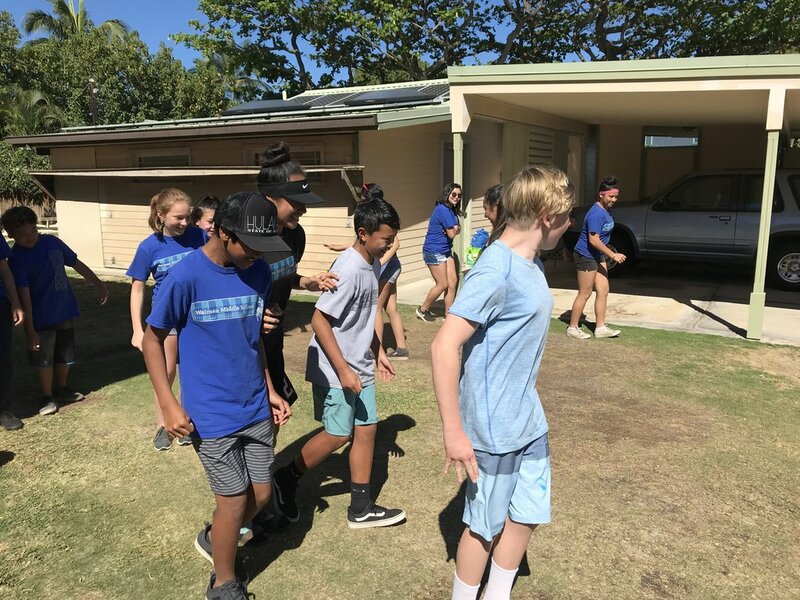 Students were led through a few games of “fire tag” to demonstrate how a native forest converts to grass savanna in Hawaii. 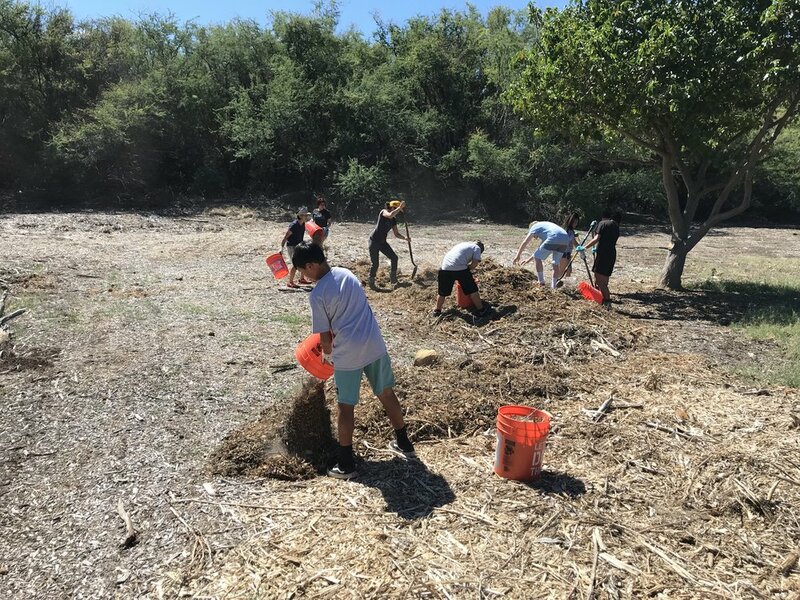 After these teaching moments, the students took action to spread mulch on the fuelbreak, keeping pesky fire-prone weeds from growing back and keeping the delicate soil in place and away from the reefs. Good work team and big mahalo to Cynthia Ho for inviting us! 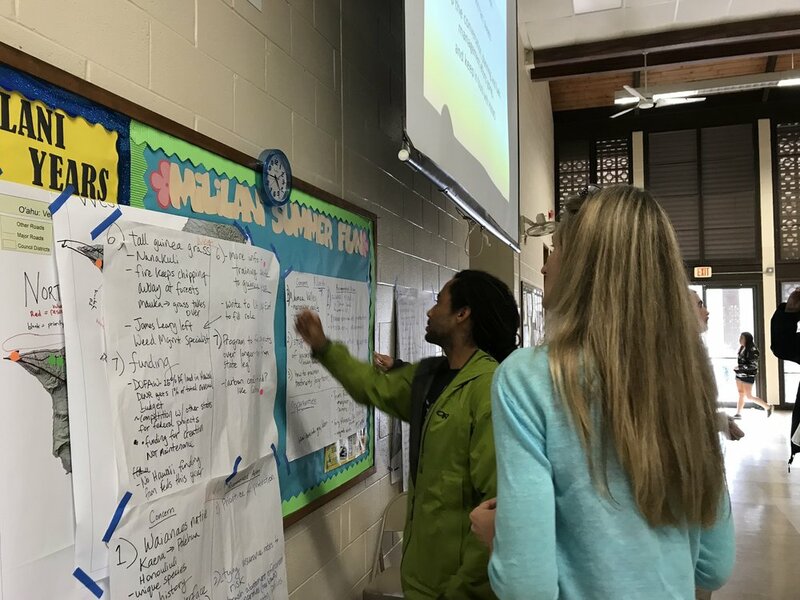 Students place stickers on priority project ideas during a mock community meeting. 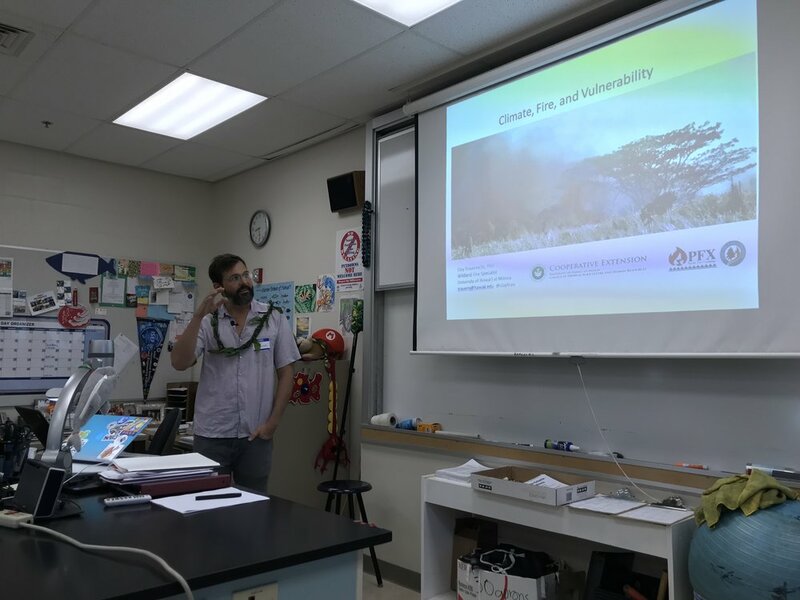 HWMO’s Pablo Akira Beimler visited Ms. Solomon’s classroom at Honokaa High School on March 5 to give a presentation about wildfire. 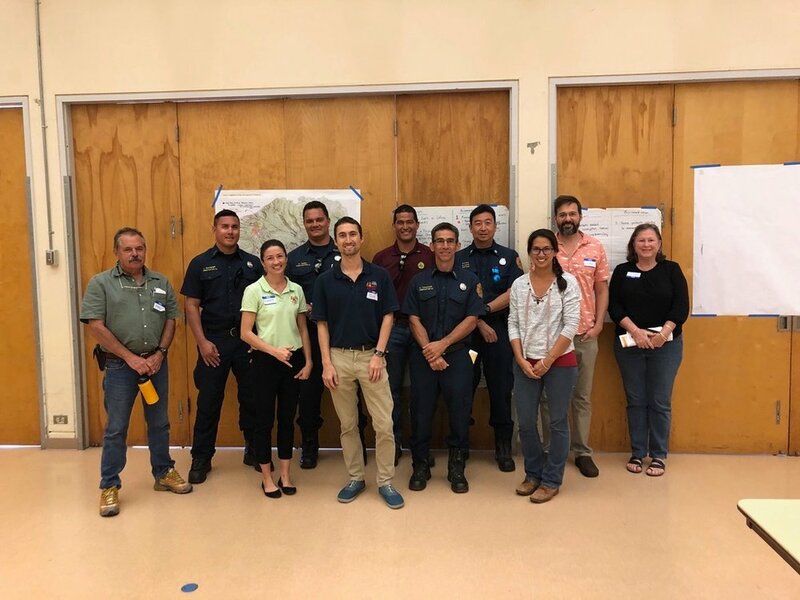 Pablo shared information on the Firewise Communities and Ready, Set, Go!, with a focus on the importance of coming together as a community to work towards wildfire protection solutions. After the brief presentation, Pablo had the students pair up for active listening exercises in preparation for a mock community meeting. 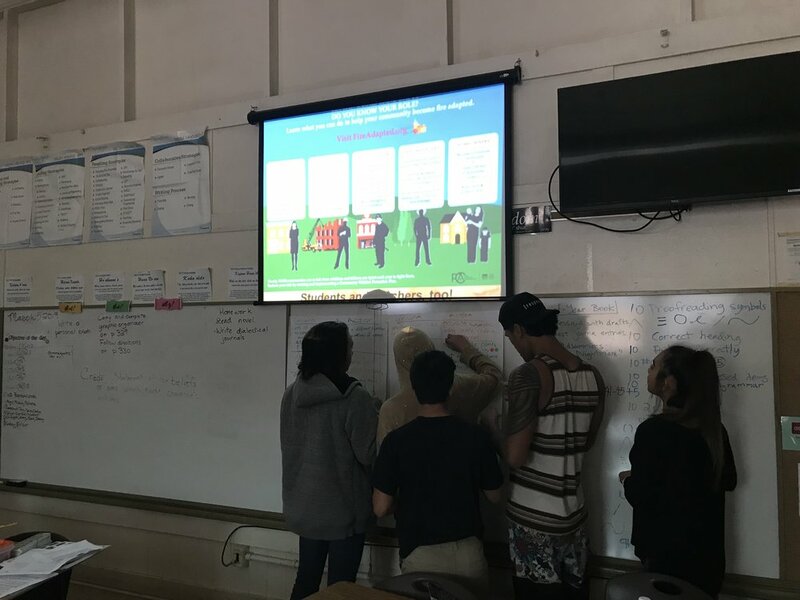 Once students understood the concept of active listening, he assigned each student a “community role” to act as, each with their own varied interests and backgrounds. Then it was meeting time — each student shared their points of view while the others tuned in. 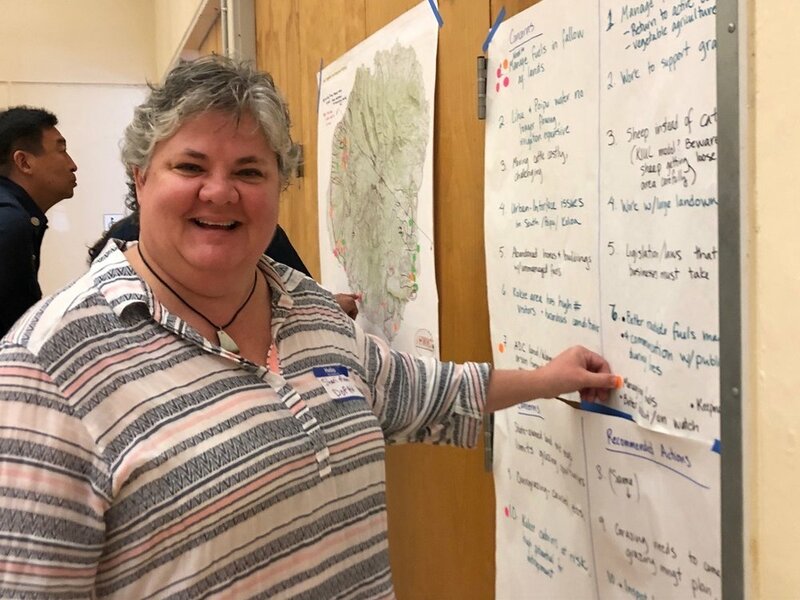 The students gave their concerns and recommended actions and then used stickers to vote on their priority ideas, just as HWMO would do at an actual community meeting. 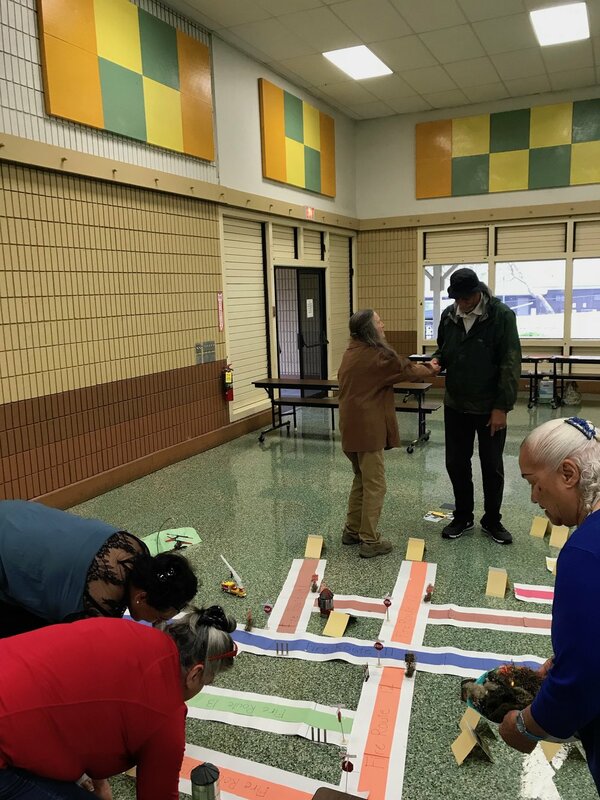 At the final tally, the “community group” prioritized native plant restoration in a community area as the most important project idea. 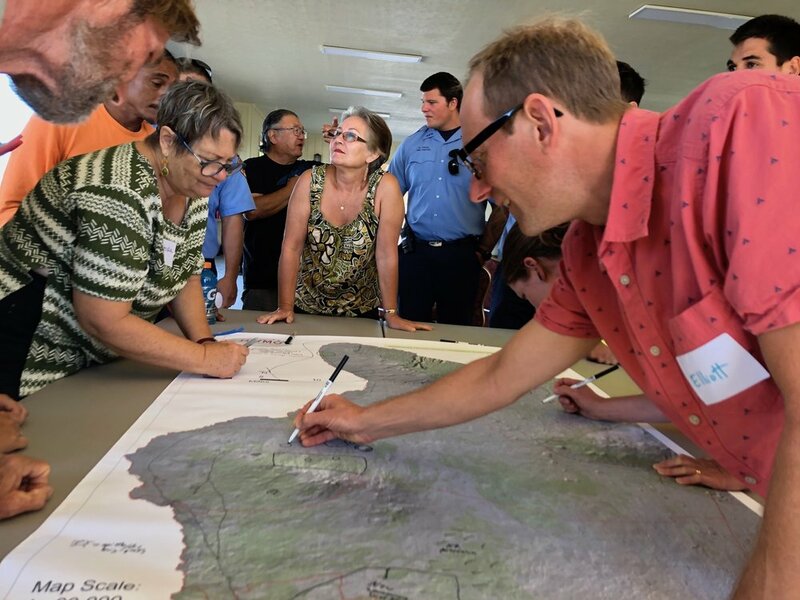 In the spirit of a true fire-adapted community, everyone came together to decide on what would be best to protect the “community” from wildfire. 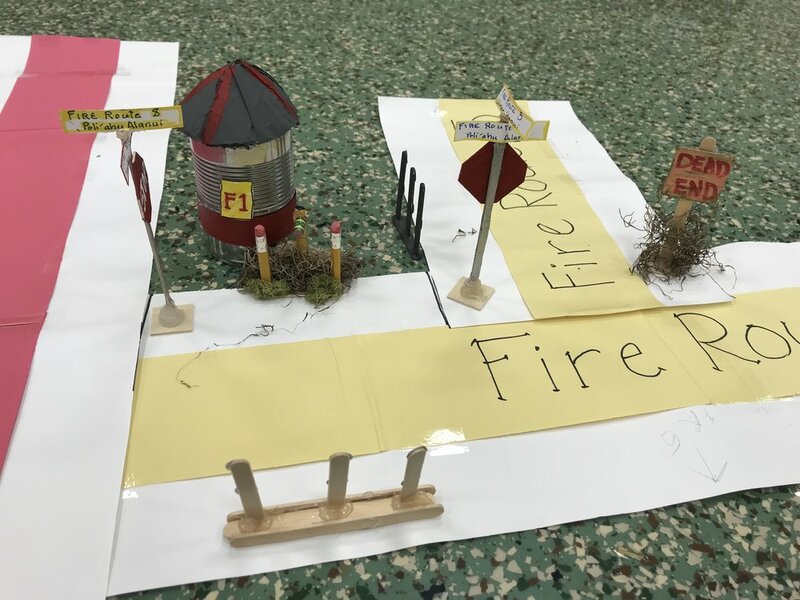 You can find this activity and more in our kNOw Fire curriculum. Thank you to everyone who joined us! Fire follows fuel. 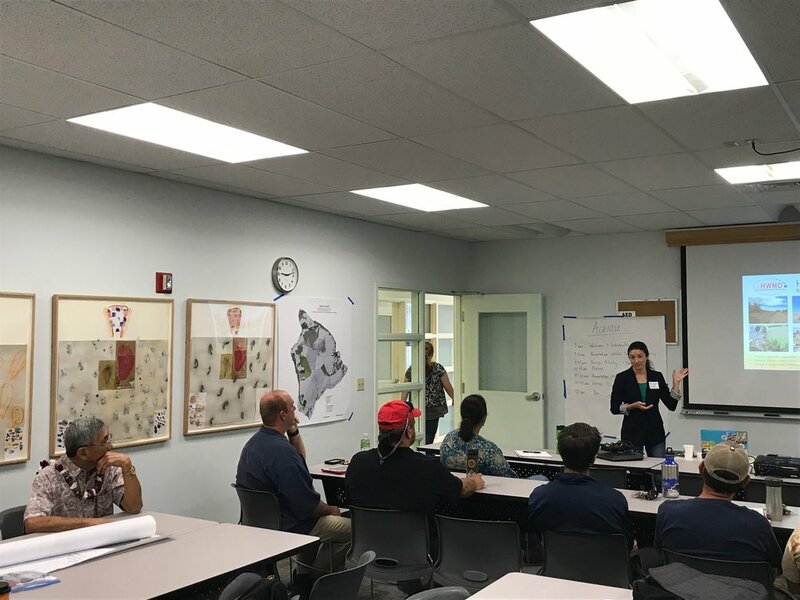 On February 26 at the Hawaii Innovation Center in Hilo, we convened a huge group of 48 people on Hawaii Island representing a patchwork of different agencies, groups, and organizations across a variety of fields to come together to plan for collaborative, large-scale vegetation management to reduce wildfire risks throughout the island. 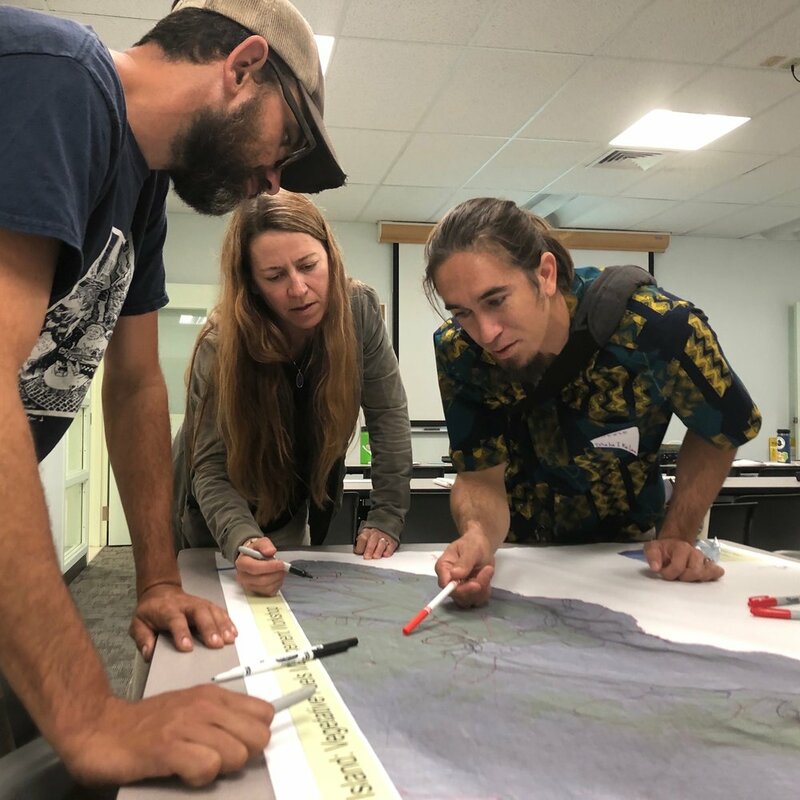 This was part of a series of workshops on Oahu, Kauai, and Hawaii Island we held in February on this matter (we had a similar meeting on Maui in 2018). 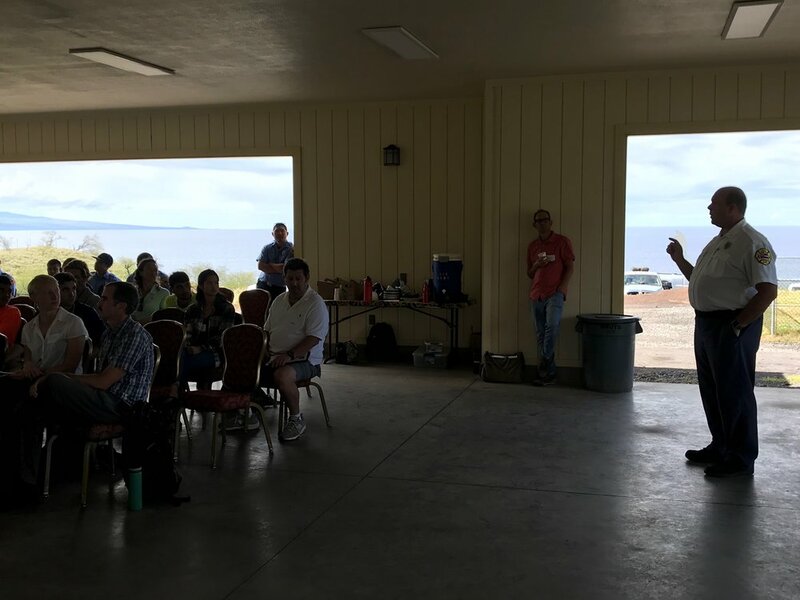 Big mahalo to the Kailapa community, a nationally recognized Firewise Community on Hawaiian Home Lands in Kawaihae, for hosting us at their beautiful new pavilion. Checked out the results of recent efforts to map current management of hazardous vegetative fuels (thanks to all of the information that partners contributed). 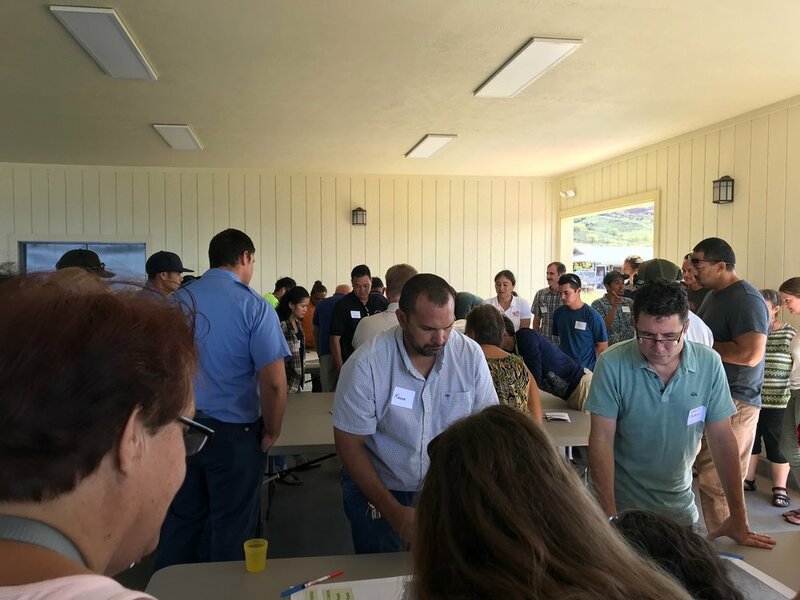 Identified and discussed shared regional fuels management priorities to mitigate the risks of wildfire across our island landscapes through a facilitated series of small and large group conversations. Marking values at risk and important areas for risk reduction. Sharing ideas for next step priority actions. Voting for priority project ideas. 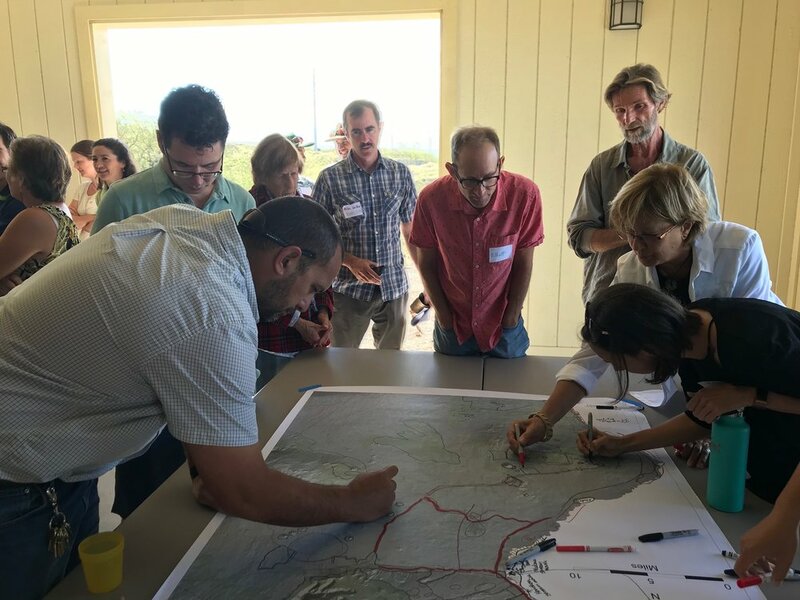 The knowledge and priorities of the participants will contribute to planning next steps in the ongoing collaboration to manage vegetative fuels to reduce wildfire and protect our communities and natural resources. We are all in this together and it takes all of us! Stay tuned via our website, social media, and e-newsletter (sign up at the bottom of this page) for final project-related products before this summer. Mahalo DOFAW, UH CTAHR Cooperative Extension / Pacific Fire Exchange for co-organizing with us. 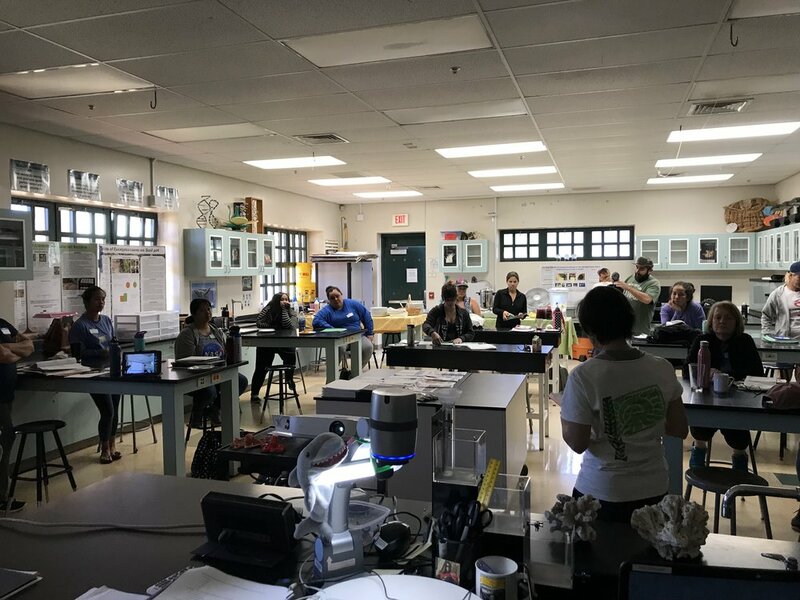 HWMO’s Community Outreach Coordinator, Pablo Akira Beimler, and University of Hawaii CTAHR Cooperative Extension’s Wildfire Specialist, Dr. Clay Trauernicht presented a full morning of information on wildfire and climate change in Hawaii to West Oahu school teachers. 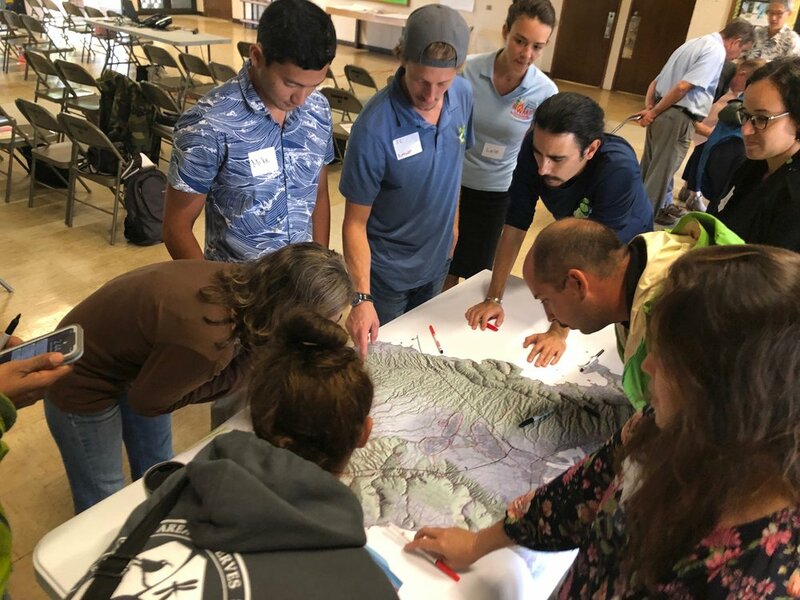 West Oahu is an epicenter of wildfire activity, so we were very grateful for the opportunity to share information on Ready, Set, Go!, Firewise Communities, and Wildfire LOOKOUT! 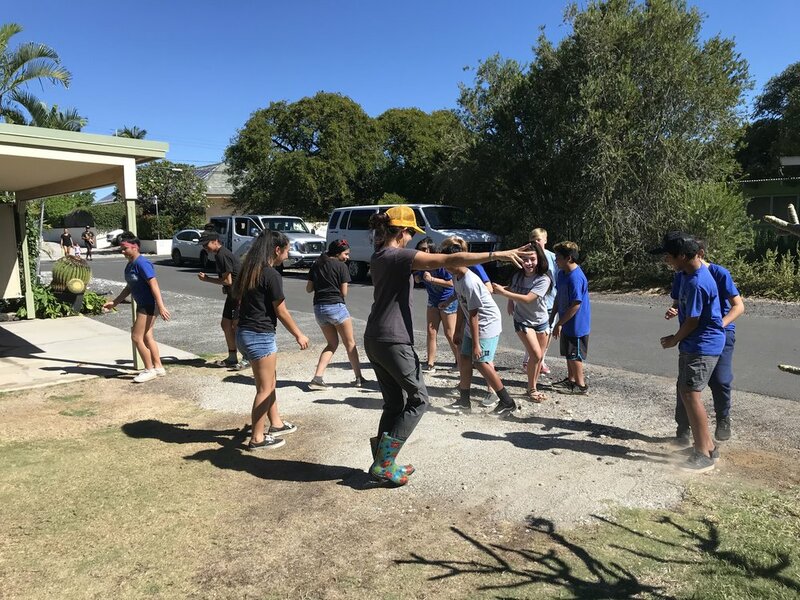 We even had the teachers do a round of “Fire Tag” to then teach to students — the game is a great way to learn about how fire has destroyed native forests and created Hawaiian savannas. Mahalo Malama Learning Center for inviting us and Kapolei High School for hosting us! Fire follows fuel. 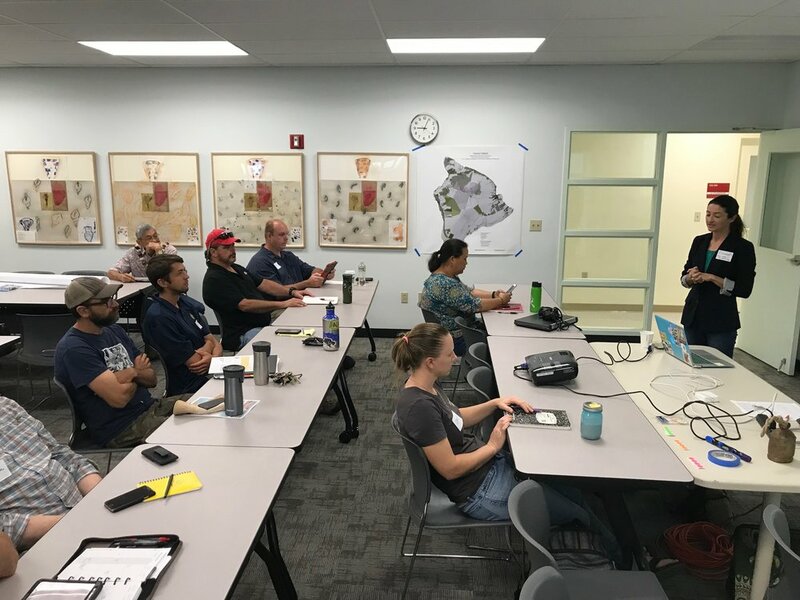 On February 22 at the Hawaii Innovation Center in Hilo, we convened a large group of 20 people on Hawaii Island representing a patchwork of different agencies, groups, and organizations across a variety of fields to come together to plan for collaborative, large-scale vegetation management to reduce wildfire risks throughout the island. 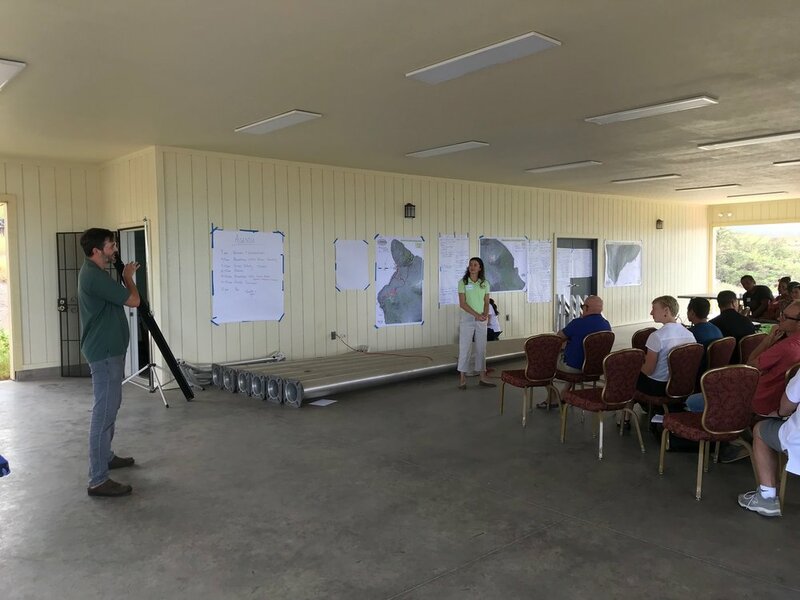 This was part of a series of workshops on Oahu, Kauai, and Hawaii Island we held in February on this matter (we had a similar meeting on Maui in 2018). Mayor Harry Kim sharing about the importance of fuels management for public safety. Marking values at risk and areas for fuels treatments. Chief Eric Moller pointing out values at risk at PTA. 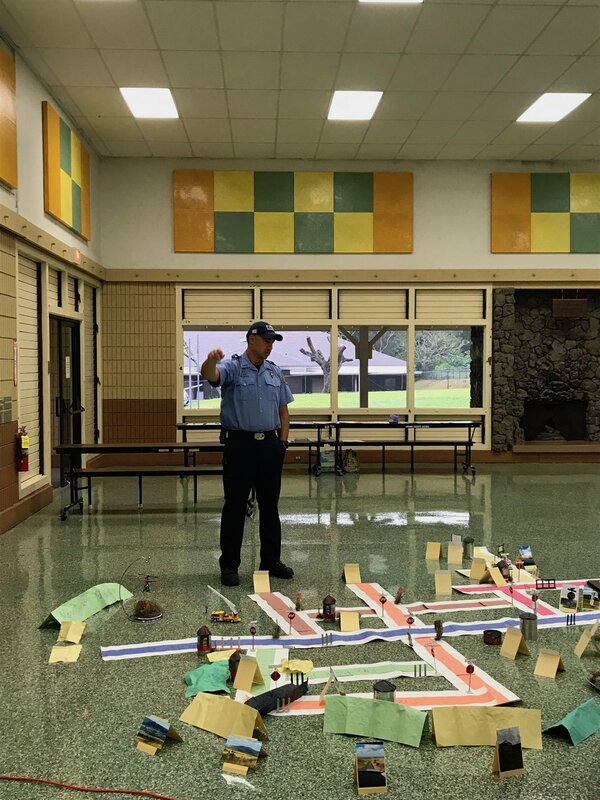 Special thank you to Mayor Harry Kim, Chief Moller from US Army-Garrison, FES and Chief Okinaka from Hawaii Fire Department for joining us at the workshop. Fire follows fuel. 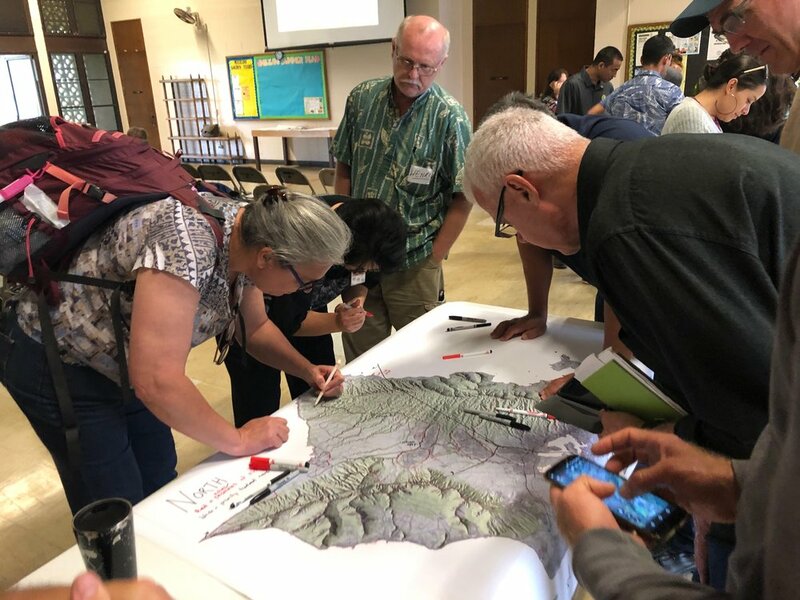 On February 21 at the War Memorial Convention Hall in Lihue, we convened a large group of 23 people on Kauai representing a patchwork of different agencies, groups, and organizations across a variety of fields to come together to plan for collaborative, large-scale vegetation management to reduce wildfire risks throughout the island. 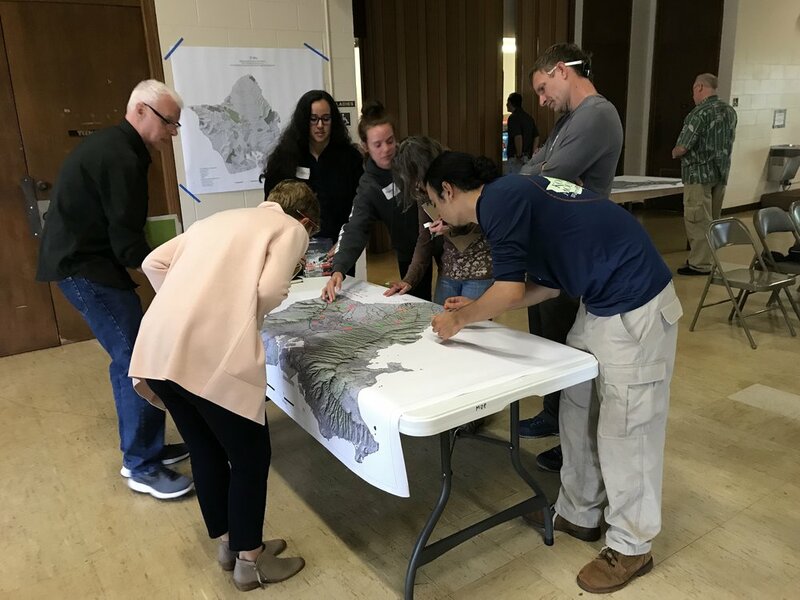 This was part of a series of workshops on Oahu, Kauai, and Hawaii Island we held in February on this matter (we had a similar meeting on Maui in 2018). Dr. Clay Trauernicht presenting on fuels management strategies. 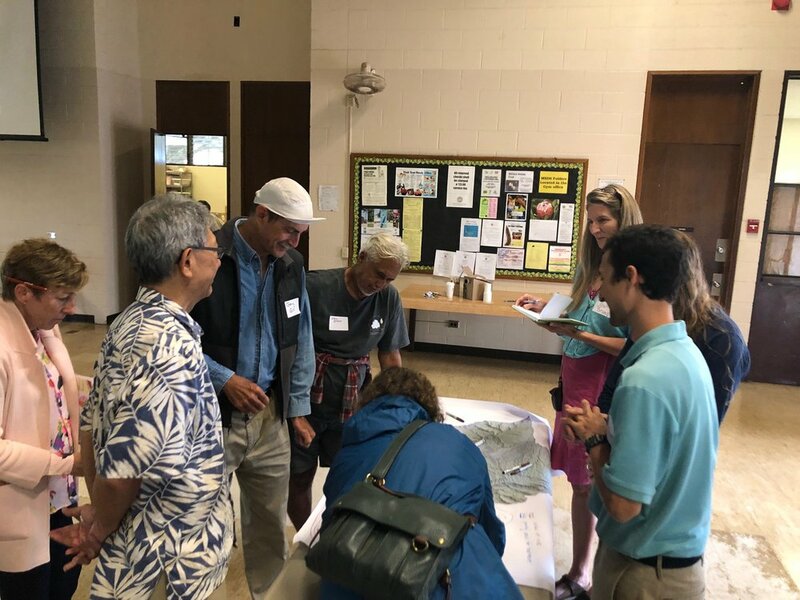 Special thank you to Chief Kilipaki Vaughan of Kauai Fire Department, Chief Akiyama of Navy PMRF and Councilmembers Kipukai Kualiʻi and Felicia Cowden for joining us and supporting this important work. Senator Keith-Agaran with HWMO staff during the office visits on February 20. Legislators are an important player in advancing wildfire protection funding and support. 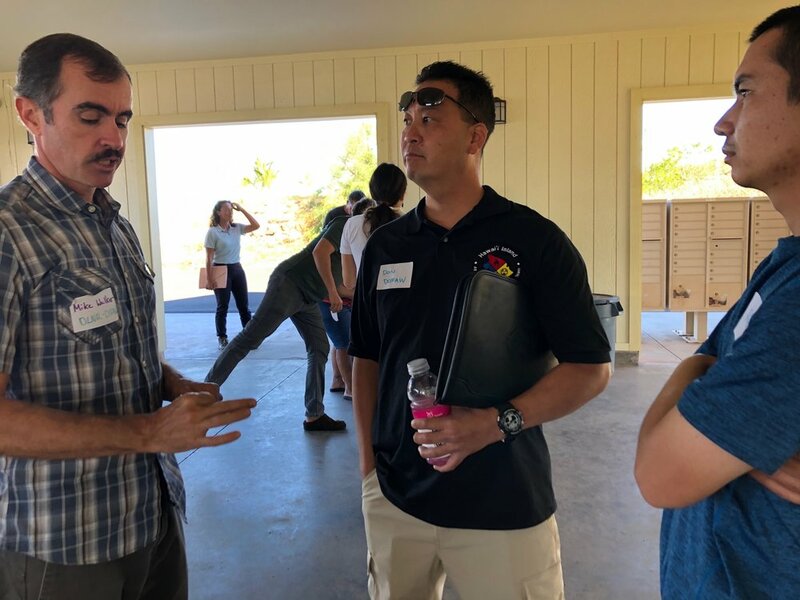 HWMO spent a full day at the Hawaii State Capitol on February 20 knocking on doors and visiting with various legislators and their aides to stress the importance of funding proactive wildfire projects with a busy fire year ahead. 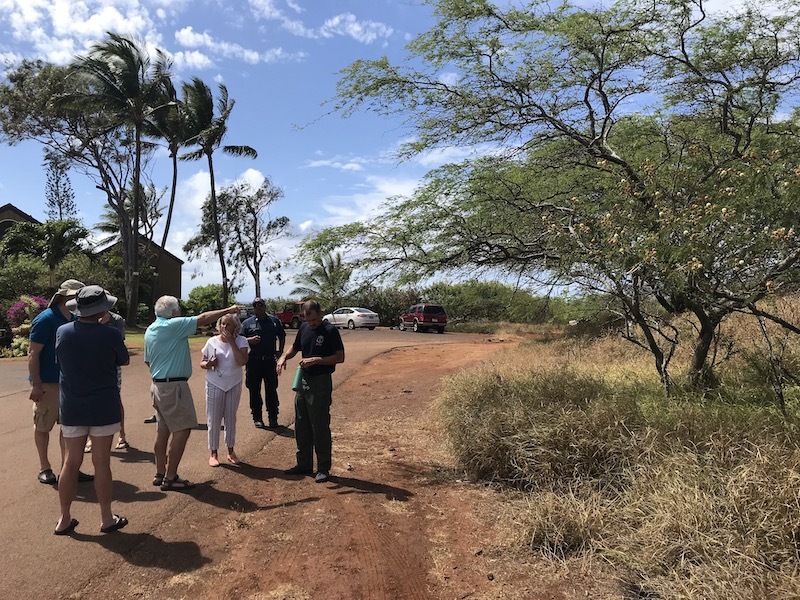 The timeliness of these visits was critical since HWMO has submitted a State Grant-In-Aid application to fund wildfire prevention and preparedness activities, including the Wildfire LOOKOUT! campaign. 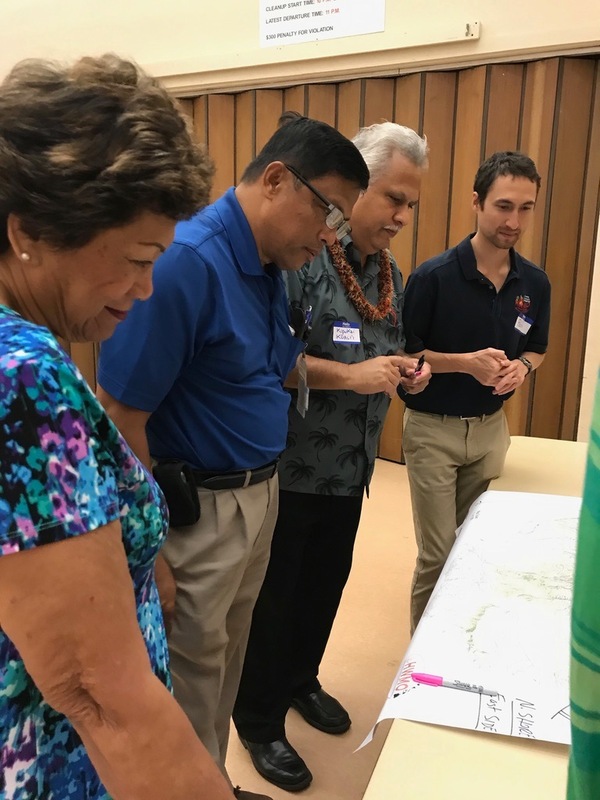 Mahalo Representative David Tarnas, Senator Gilbert S.C. Keith-Agaran, Senator Dru Kanuha, and Representative Stacelynn K.M. Eli for meeting with us in person. Fire follows fuel. 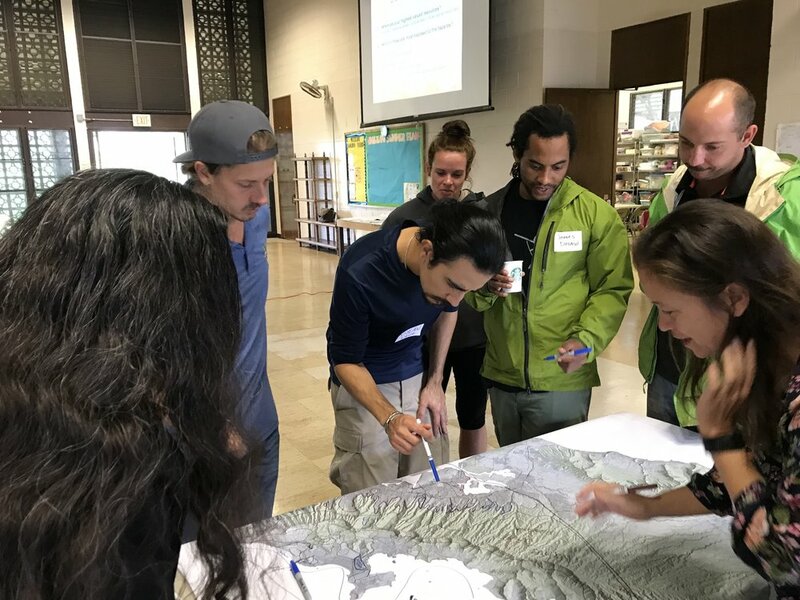 On February 19 at the Mililani District Park, we convened a large group of 33 people on Oahu representing a patchwork of different agencies, groups, and organizations across a variety of fields to come together to plan for collaborative, large-scale vegetation management to reduce wildfire risks throughout the island. 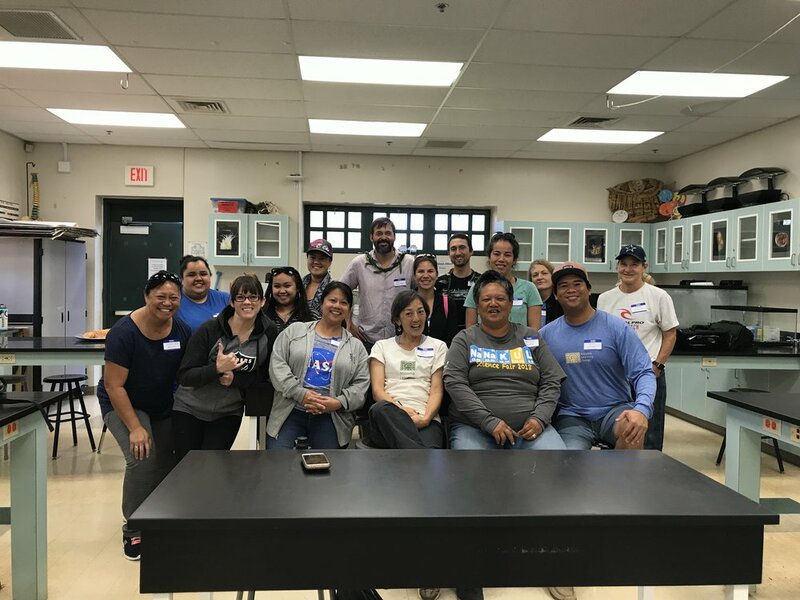 This was part of a series of workshops on Oahu, Kauai, and Hawaii Island we held in February on this matter (we had a similar meeting on Maui in 2018). More identifying of key areas.